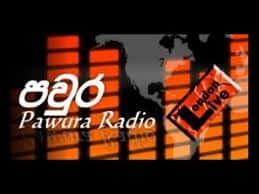 Pawura Radio Sri Lanka FM Live Streaming Online . Listen over 60 Sri Lanka FM Radio Stations live Streaming Online . Enjoy Live Stream of Srilanka Music News 24 by 7 Online . ALL FM statios Plays well in Google Chrome or Mozilla Firefox browsers . Pawura Radio Srilanka is one of the most Famous Radio Station.